My little sister is little no more. I had the great pleasure of attending her university graduation ceremony yesterday. As she strode up the stage a confident, pint-sized princess in a flowing gown, I couldn’t help wonder what happened to the bald midget that used to eat mangoes in her knickers what seems like only a few years ago. Now officially homeless and jobseeking, the Bollywood starlet is spending her days looking for meaningful employment. All under the strict tutelage of her older and somewhat wiser sister (that would be me) and a much older and wiser mother. It’s not just the career direction I’m taking an interest in. Her diet too swings like a crazy pendulum, from a crash course of GM to a bag of gluten free, butter rich biscuits. I made this paneer butter masala for her – a thick and creamy Indian cheese curry. Normally, this is a fatty North Indian feast awash with cream and butter. I managed to tone it down a little, without losing its essence, using Greek yogurt and a butter substitute. This one’s great when you want to impress – hungry students and other very important people. 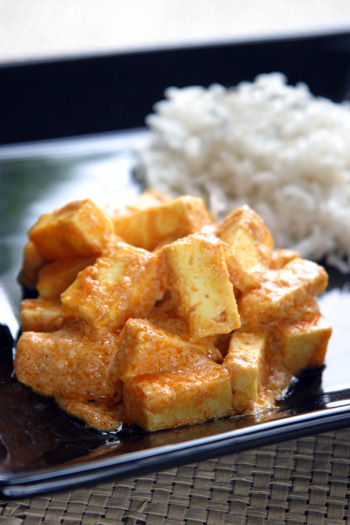 Mix a quarter teaspoon each of the chilli and turmeric powder into the cubed paneer, along with a little bit of salt. Puree the ginger and garlic to a fine paste. In a pot, heat the oil on a high flame. When hot, add the masala coated paneer and fry for five minutes until pale brown. Remove the paneer pieces and in the same oil, add the bay leaf. Within seconds the bay leaf will start sizzling. When this happens, add the ginger and garlic puree and stir gently until it turns translucent. Now add the chilli, coriander and turmeric powder, and tomatoe puree, stirring vigirously on a high flame until the pungent smell of masalas go (about two minutes). Then spoon in the yogurt, lower the flame, and simmer for five minutes. You will see the colour of the yogurt change from pale white to a rich red as the masalas blend into it. Now stir in the paneer pieces, the pureed cashewnuts, and the garam masala. Simmer for five minutes and then add the kasoori methi, along with its water, and salt to taste. The kasoori methi and garam masala are added to cut the tangy taste of the curry and make it a more balanced creamy one. Give them a good two minutes to do their magic. To finish, stir in the butter substitute and enjoy piping hot with some aromatic pulao. Paneer butter masala!! YUM!! Looks great. Love the color.Good to hear about your sis.Hope her Bollywood dreams come true. This sounds heavenly. Haven’t had paneer in ages either. 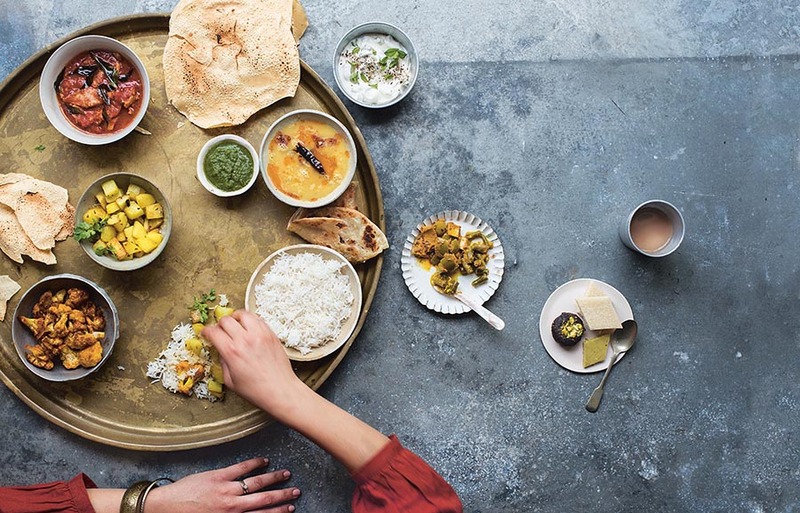 Hi, Mallika, great blog with good recipes. Loved ur blog. Lovely recipe :). I am new to the food blog world and loved all your recipes. Good luck to your little sis and keep posting nice recipes. oooh, now I am just one person from knowing a Bollywood star-let! The paneer looks scrumptious with the added bonus of lower calories! Yay! The photo is awesome, and it looks very delicious. I was going to try out this particular dish, paneer butter masala, but i wasnt able to find the greek yogurt in my grocery store…. is there anything else i can use instead? like is this yogurt think or something …… then i can strain the regular 2% yogurt in a cheese cloth…… or get the already strained thick yogurt from the indian store… and can i also use the substitute for one of the chicken recipes you used the greek yogurt as well? There are two things you can do – strain the normal yogurt or whip it up nicely until it’s frothy in the food processor before using it. The only reason I use Greek yogurt is because it doesn’t split when cooking thanks to its thick texture. With either of the two techniques, you’ll get around this problemo. Do let me know how it comes out! Hmmm… all the paneer masala’s I’ve made before have onions in them. Did you skip the onions for the lower calorie factor or do you always make your paneer masala without the onions? I will totally be trying this recipe tonight or tomorrow! The yogurt is a new addition. Never tried paneer with a yogurt gravy. Good luck to your sister – she’s a Bollywood starlet ? I have to confess that I have never tried paneer. The sauce ingredients sound wonderful. I made this for the first time tonight and although I used low fat yogurt it was still delicious. Hubs even commented on how good it was and that he now really likes paneer! Fairly good post. I just stumbled upon your weblog and needed to say that I have really loved reading your weblog posts.Any method In poor health be subscribing to your feed and I hope you publish again soon. Good job. Where can you verify this information anyone know?? Just wish to say your article is as astounding. The clarity for your publish is simply nice and i could suppose you are an expert in this subject. Well together with your permission allow me to clutch your RSS feed to keep up to date with imminent post. Thanks 1,000,000 and please carry on the gratifying work.